JIPMER MBBS 2019: Jawaharlal Institute of Postgraduate Medical Education & Research (JIPMER) is a medical institute located in Pondicherry offers both undergraduate and postgraduate medical courses. Latest Update: JIPMER MBBS 2019 Online Registration will be closed on 12th April 2019, fill the Form before the last date !! Latest Update: JIPMER MBBS 2019 Online Registration will start from 6th March 2019 !! 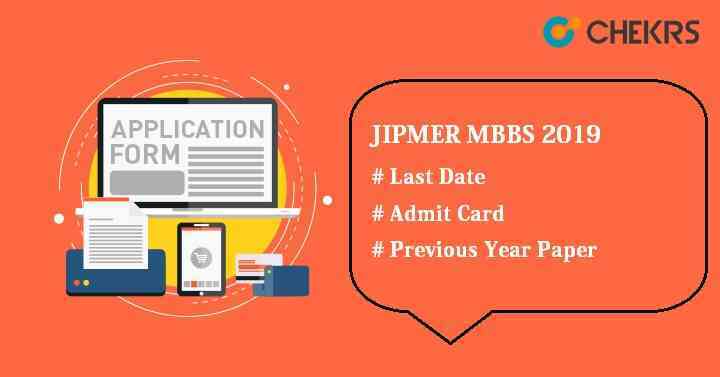 Latest Update: JIPMER MBBS 2019 Dates Announced !! JIPMER MBBS Entrance Exam is a national level entrance exam conducted by JIPMER to get admission in MBBS course. JIPMER Karaikal & Puducherry campuses will provide the admission to the eligible candidates. 200 MBBS seats are provided by the JIPMER for candidates wishing to take admission for MBBS course. JIPMER official authority will issue the notification for online registration form in the month of March. Here we have mentioned the information related to JIPMER 2019 like JIPMER exam date, result, syllabus, merit list etc. Candidates are advised to go through the expected exam schedules of JIPMER MBBS 2019. Here we have provided the JIPMER UG Important Dates. Check the JIPMER MBBS Eligibility Criteria prescribed by JIPMER. It is mandatory to meet all the criteria to appear in JIPMER entrance exam for MBBS. Candidates must be citizen of India. Overseas citizen of India are also eligible. Applicant’s minimum age should be 17 years as on 31.12.2019. Candidates who will appear for class 12 or equivalent exam in March/April 2019 can also apply. Students must have passed 10+2 with minimum 50% aggregate in PCB stream. For OBC/SC/ST/OPH, there will be relaxation of 10% in percentage. JIPMER will commence the JIPMER MBBS Application Form in the month of March on its official website. Interested Candidate can fill the online application form and submit it before the last date. Click on the link present on the home page for “Apply Online MBBS Admission-2019”. Fill the application form, upload recent photograph of file size 10KB-80 KB and signature also. Pay the fee through online mode payment gateway Credit card/ Debit Card/ Net Banking. JIPMER MBBS Exam Pattern or Paper Pattern will be decided by JIPMER official authority. It gives the idea about the paper and exam also. To give exam in better way, candidates should know about the exam pattern before appearing for the JIPMER entrance exam. The Exam will be held through Computer Based Test (online). Total 200 multiple choice questions will be there having 4 option. Time duration will be 2 hours 30 minutes. 1 Mark will be deduced for the wrong answer . 4 marks will be allotted for each correct response. Exam will be conducted in 2 shifts. One will be in Morning & other shift in Evening. The medium of question paper will be in English language. JIPMER Exam Syllabus will not set by the official authority of JIPMER. JIPMER Syllabus 2019 will be same as the syllabus of class 11 & 12 syllabus prescribed by CBSE or State Board of Higher Secondary Education. The question paper will cover all units of Physics, Chemistry, Biology and English. JIPMER MBBS Entrance Exam will be conducted in month of June. To prepare in better way and score good marks, candidates can check the JIPMER MBBS Sample Paper provided with solution in Pdf form. JIPMER also provides mock test to practice for the exam. Make time table and follow it strictly. Make key points and revise it daily. Use reference books and go through the whole syllabus. Admit Card will be issued in the month of May and candidate can download it from the official website of JIPMER. It will release the JIPMER MBBS Hall Ticket for those candidates who will submit the form successfully. Visit the JIPMER official website. Enter candidates/ user ID and password and then click on login. Click on the link for ‘Hall ticket for JIPMER MBBS Entrance Examination-2019’. The Admit card will be appear on the screen. Take the print of it. JIPMER entrance examination will be conducted through computer based test, so the JIPMER authority will not release any JIPMER MBBS Answer Key. JIPMER will announce the result in online mode on its official site. JIPMER MBBS Result will be released in two form one will be Merit list for the shortlisted candidates and other will be individual score card for all the candidates either they qualify the exam or not. Go to the option Exam and then search for Result of MBBS Entrance Exam 2019. To download the individual Rank Letter, click on Download Rank Letter. Enter User Id and Password and login into the account. JIPMER UG Merit List will be prepared according to the category-wise. It will be published along with the results. Candidates who will not score the minimum percentile, their name will not be included in the merit list. Candidates who will appear in JIPMER MBBS entrance exam will need to score the minimum percentile decided by JIPMER. JIPMER MBBS Cutoff will be the minimum marks required to be eligible for admission into JIPMER Puducherry & JIPMER Karaikal campus. It changes every year on the basis of factors like difficulty level of paper, previous year cutoff, availability of seats. Counselling is the last process for admission into JIPMER campuses for MBBS course. Shortlisted candidates have to register to participate in the JIPMER MBBS Seat Allotment. It will be organized through offline mode. Applicants have to report at the counselling venues along with the documents for document verification. On the basis of performance in the entrance exam, seat will be allotted.